Let’s first understand the meaning of “Business” and “Analysis” independently. Business: A business is also known as an enterprise, a company, or a firm, an entity that either produces goods or offers services either for profit or not-for-profit. For example, a manufacturing company offers a product and/or services to the customers. A car company produces cars and also manages service stations for servicing cars or selling their spare parts. Similarly, a service company such as a hotel or hospital or courier company offers services for a certain charge, while a government entity offers services with or without charges. For example, a government official issues a birth certificate after verifying a newborn’s birth details and receipt of the charges for processing the certificate. However, in most cases, state government provides free police service to keep cities safe. The products or services are dependent on their market segment, services, and companies’ policies. For example, five-star hotels and bed-and-breakfast motels offer services at different costs. There is a significant difference in the cost because of their market segment, customers’ backgrounds and needs, and the overall quality of services. Analysis: It means simply breaking down the information of an object, entity, process, or anything else to understand its functioning. What is the role of each component? How does each component function independently? How do these components function together? To understand this, we simply break down the information in a systematic manner. For this, we can use a “functional decomposition”, one of the business analysis techniques. Let us use this technique to understand the admission process. 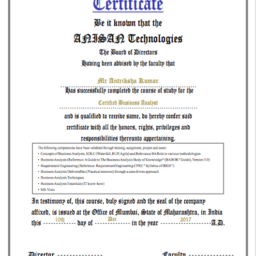 ANISAN is a consulting and training firm. It provides training services to its customers and every participant who wishes to join the training is required to complete the admission process. How this admission process can be broken down systematically is shown in the picture below. In the above table, the admission function/process is broken down into three processes – enquiry, enrollment, and training. Subsequently, each process is further broken down into tasks. These tasks are indexed in a unique way to identify them easily. What is a Business Change? These business changes typically imply technology implementation, mergers & acquisitions, business process re-engineering, etc. Business change impacts the business, people, and technologies partially or completely, depending on the nature of the business change. Implementing business change requires a cohesive effort. This term may be known as business change, business transformation, or simply changes. To avoid confusion and conflict between business change and requirement change, both these terms are explicitly mentioned throughout the book as either business change or requirement change. The major difference between business change and business transformation is – while business change is applied to small or big business changes, initiatives or projects, business transformation is applied to only big changes. Although this book primarily focuses on business change from a business and technology perspective, we have made an attempt to include a few aspects of other factors as well. In addition to the above-mentioned factors, to analyze the current-state, the business analyst will have to study the products, services, operations (how products/services are delivered to the customer, how policies, and regulations, including internal and external regulations, affect the operations, etc.) and business needs. While recommending a solution, the business analyst will have to synthesize the market data before defining future-state. 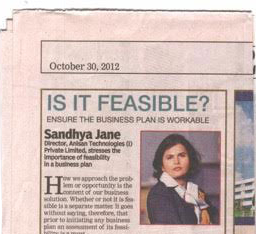 This ensures that the potential solution is suitable for current and future needs. What is the importance of a Business Analyst in an organization? The business analyst plays a significant role in an organization by examining business needs and recommending solutions or improvements that are directly related to revenue, business risk, brand image, customer service, and/or business operations. 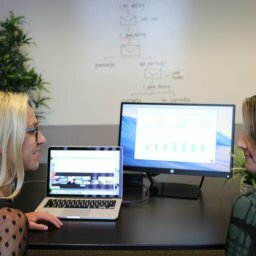 Also, the business analyst acts as a bridge between business stakeholders and IT stakeholders (IT team) by communicating and collaborating with business stakeholders and the technical team for defining and deploying the solution. This communication bridge is primarily to understand and communicate effectively with stakeholders from diversified backgrounds for understanding and accepting the collective vision of solution. The business analyst also helps create an environment of transparency, openness and trust among team members to build a common platform to share ideas, and understanding of business change that eventually helps in mitigating the project risks. The business analyst significantly contributes to the requirement management processes, including the requirement documentations for business and technical stakeholders to share the common project vision. These documents are created in standard templates and supported by models such as Unified Modelling Language (UML), process diagrams, Entity Relationship Diagrams (E-R Diagram), etc. These documentations serve as a basis for defining, designing, developing, testing, and deploying activities of the solution. Afterwards, they serve as the basis for a user manual. 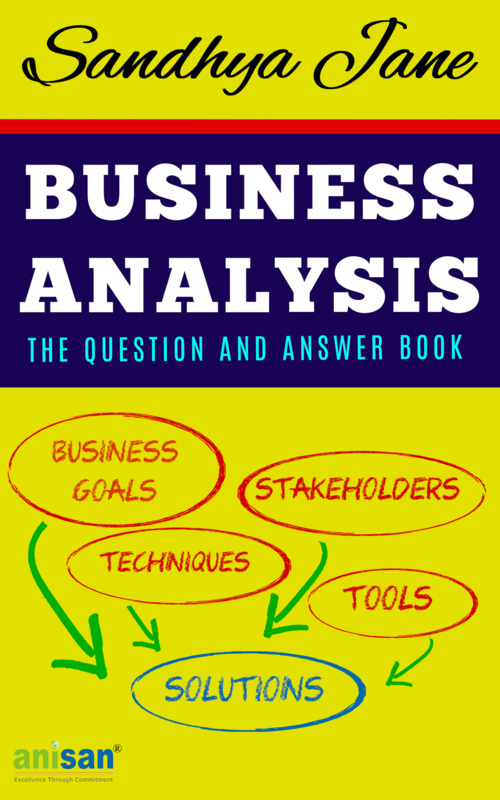 What is Impact Analysis in business analysis field? Impact analysis assesses the impact of the change (business or solution or requirement) on the business or solution. Depending on the nature of the change, it may have a limited impact on a particular business unit(s) or on the original requirement or on the entire organization. Impact analysis is conducted while defining the business needs, solution scope, requirement traceability, change management, and post-implementation. As an important part for any learning is there mentor, and here Ms.Sandhaya Jane is really best I found as the way she trained was like a parent hold the hand of small child while the baby learn to start walking, I believe from this point I can learn myself to fly with her future guidance. 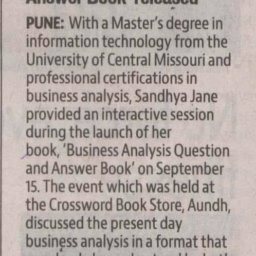 Thats all from my part, I would really encourage business analysts to read her upcoming book on business analysis: The Question and Answer Book. Thank You madam for such a nice informative mentoring. Please update your new book.